Take a scenic drive to experience the beauty of the “Panorama Route” in the Blyderiver Canyon, which is 60 km long and is the third largest canyon in the world. There are a few viewpoints (God’s Window, The Pinnacle, The Three Rondawels) along the edge of the escarpment offering excellent views of the Blydedam, canyon and the river 600 m below. Visit the Berlin Falls can be reached by means of a foot path along the river where the water from the Berlin Creek falls down a 150 m drop into a large pool. The Lisbon Falls are at the point where the Blyderiver splits and large pools are formed before the water cascades over the sheer cliff to a pool 92 m below. The Mac Mac Falls viewpoint offers a spectacular view of this waterfall which was so names after the number of miners from Scottish descent. 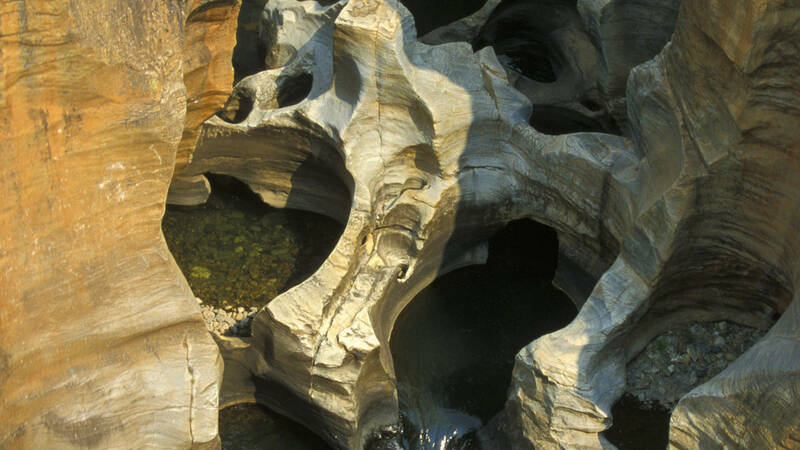 The Bourke’s Luck Potholes are deep cylindrical holes formed by the action of the sand and rock carried down by the river when in flood. Visitors can obtain a close view from bridges specially constructed over the potholes. Also visit the historic town of Pilgrim’s rest which is now a National Monument. It was established in 1873 when the first significant gold strike in South Africa was made.